Fantasea Charters: Enjoy yourself and relax on our stable 40’ catamaran. Our cruise leaves twice daily from Agat Marina and Hotel pick up is available. All fishing and snorkeling gear is provided, as well as tea and mineral water, however you are welcome to carry aboard your preferred drinks. 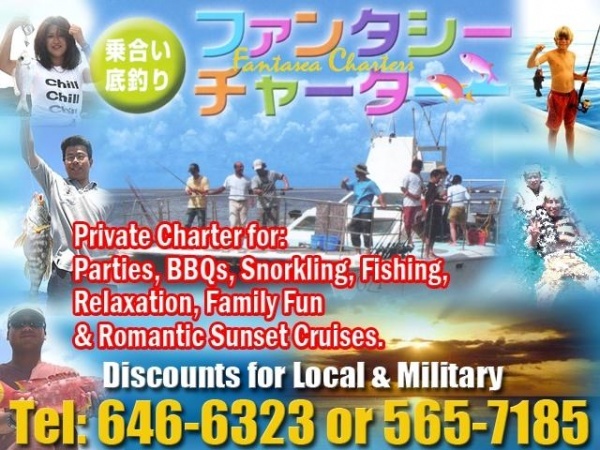 Fantasea Charters were no doubt a better option over going through any cruise lines. They take less numbers of people, and cost much cheaper. We went snorkeling with this charter and had a blast. The reef was awesome. The sea creatures were as good as I have seen anywhere and the water was so clear. This was the highlight of our vacation in Guam last year. We took Fantasea Charters service to enjoy the whole day. We had fun snorkeling, barbecuing and just being together. February 14, 2011 was a memorable day to me. I enjoyed a Romantic Valentine’s Day Cruise onboard Fantasea Charters!